T cell lines grown in the presence of 1 peptide can respond to stimulation with a second unrelated peptide. (A) CD8+ T cells were isolated ex vivo from healthy donor D-002 and costained with M1- and BMLF1-loaded tetramers; 106 events were collected. (B and C) Fresh CD8+ T cell lines derived from donor D-002 were grown for 3–4 weeks in the presence of (B) M1 peptide–pulsed or (C) BMLF1 peptide–pulsed T2 cells and then stained intracellularly for the production of IFN-γ or MIP-1β following 5 hours of stimulation with various HLA-A2–restricted peptides at a 5 μM final concentration. Percentages of CD8+ T cells producing each cytokine are shown. 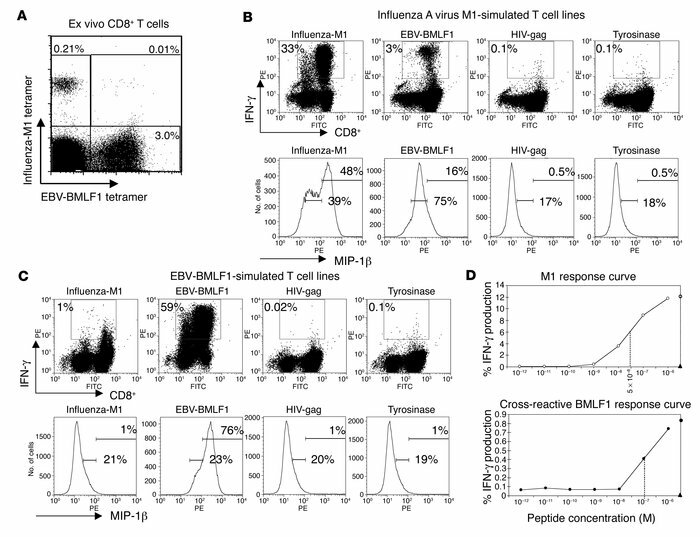 (D) Titration of peptide concentrations in an intracellular IFN-γ assay using an M1-specific T cell line derived from donor D-002 demonstrated a slight difference in avidity for M1 versus BMLF1. Filled triangles, tyrosinase; open circles, M1; and filled circles, BMLF1 stimulation.